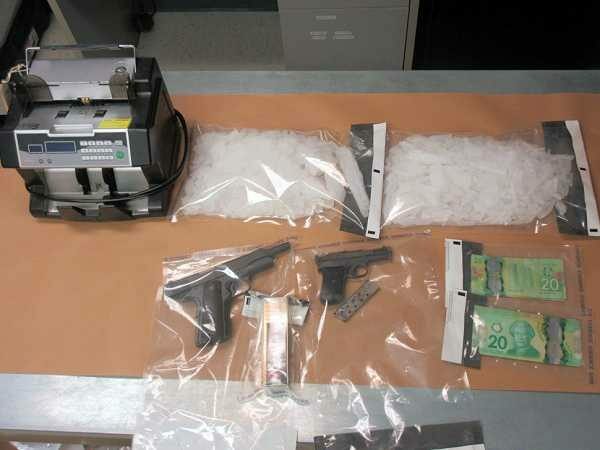 Prince Albert, Saskatchewan – On April 9, 2019, Prince Albert Combined Forces Special Enforcement Unit (CFSEU) completed a lengthy drug trafficking investigation that culminated with a vehicle stop near North Battleford that resulted in the seizure of 2 kilograms of methamphetamine and $1000.00 cash. Prince Albert CFSEU subsequently executed five search warrants in Prince Albert and area that resulted in the seizure of two handguns, ammunition, a money counter, drug trafficking paraphernalia, and a large amount of cocaine cutting agent. Clarke appeared in Prince Albert Provincial Court on Thursday, April 10 and was remanded to her next appearance on Monday, April 15 in Prince Albert. Pederson appeared in Prince Albert Provincial Court on Thursday, April 10 and was remanded to his next appearance on Wednesday, April 17 in Prince Albert. Svendsen will make her first appearance in Prince Albert Provincial Court on Wednesday, April 24, 2019. The Saskatchewan Combined Forces Special Enforcement Unit (CFSEU) is a province wide integrated policing task force formed to investigate existing and emerging organized crime groups. Saskatchewan CFSEU has units located in Regina, Saskatoon, and Prince Albert with a common mandate to target criminal organizations operating within the participating agencies jurisdiction and surrounding areas and to disrupt and dismantle criminal organizations.